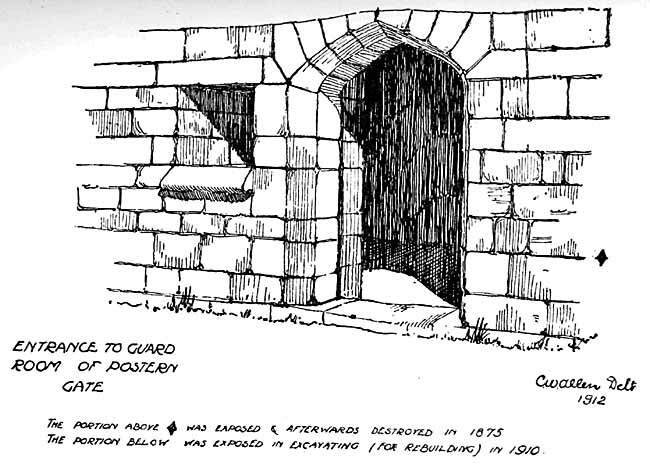 A Guard-room of the town wall of Nottingham. By Mr. F. W. Dobson. THERE is occasional reference in our Borough Records to gateways which existed in the mediaeval wall of Nottingham. We have mention made of the West Bar or Chapel Bar, of the North Bar at the top of Clumber Street, of the Swine Bar at the bottom of Heathcote Street, and the Postern at the top of Park Row. Of gateways on the east, and on the south at Hollow Stone and Drury Hill, the Records tell us nothing. It is true that the existence of an East gate, and a South gate at Hollow Stone, has been doubted on the ground that there is no substantial proof of a defensive wall on those sides of the town, and the lack of evidence of any definite nature almost warrants us in coming to that conclusion. It seems very difficult, however, to imagine that there would not have been a gateway at Hollow Stone. Straight in the line of the Trent and Leen Bridges it naturally suggests itself as the southern entrance to the town, and Deering mentions—though we need not lay too much stress on this, as he probably wrote from hearsay—that there was evidence of a gateway just before he wrote his History. Against this, however, we must put the evidence of Leland, who, when he visited the town about 1540, saw only "two or three" gateways of the old wall standing. These would, in all probability, be the Westbar, the Northbar and the gate at Drury Hill, as we have the records of their demolition in the seventeenth and eighteenth centuries. As to the question of a wall on the east side of Hollow Stone, there is a piece of old walling in a narrow passage called Scotland Yard, a few yards east of the road, which shows all the characteristics of the town wall as we know it. It is built of blocks of Lower Keuper sandstone bedded in the mixture of coarse sand and red clay which was found at the Postern Gate and in other exposed portions of the wall. Its position too, is exactly in the right line for meeting a gateway below the turn of the hill. But the gateway which concerns this brief note is the one which stood at the top of Drury Hill, and of which the plan engraved by the Fleming Jodocus Hondius for Speed's "Theatre of Great Britain" in 1610 is our earliest evidence. Deering first gave it the name of the Postern, but we may be sure that it was not a postern in the generally accepted meaning of the term, i.e., an arched opening in the wall. There is little doubt that it was one of those gateways, of which most walled towns of England have given us an example, Consisting of a small square tower, embattled, and pierced by a passage which was closed by gates and portcullis. This type of gate we find as a minor entrance in some of the large towns, and as a main entrance in the smaller and less important ones. 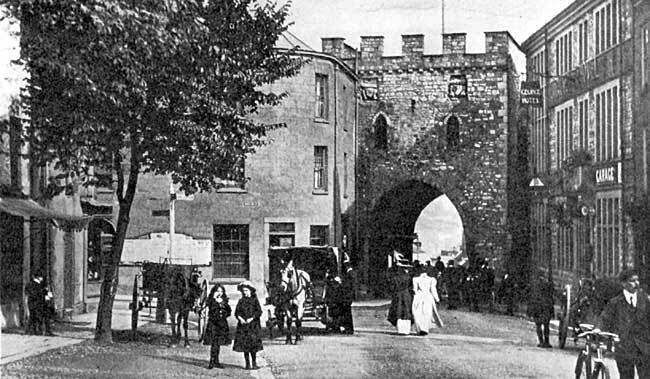 The town gate of Chepstow though modernized is a good example which survives. As bearing out our contention as to the structure of this gateway, we have the evidence of Speed's plan of 1610, and more particularly Thoroton's of 1677, where we find a tiny representation of it, but large enough and sufficiently well drawn to show us definitely and distinctly that it is the type of gate-tower we should expect to find. Approximately we may place the date of it's erection between the years 1280 and 1320,—its destruction about 1735. Deering writing about 1745, says:—"Over against Bridlesmith Gate there stood an ancient Postern till within these ten years, on the east side of which where now the Bull's Head is,1 was a gate-house where a guard was kept as is to this day plainly to be seen." In all probability the gateway itself was destroyed a few years before Thomas Sandby made his local drawings, or he would have left us a record of this interesting and ancient bit of Nottingham.2 But it is plain from Deering's remarks that a portion of the guard-room entrance still stood above ground, exposed to view, beneath the overhanging timbers of the old Elizabethan or Jacobean house which was built upon its ruins. Years after this ancient bit was covered up when the house was enlarged and a frontage of several feet added on its north side. In 1875 alterations were made to the interior of the Inn and the floor of the main room lowered several feet.3 Once again part of the old guard-room entrance was exposed, and—on this occasion—destroyed. Plan of guard room, of postern gate. The guard-room stood facing Bridlesmith Gate with a look-out window on its east side. The height of the entrance door was approximately eight feet, and its width five feet six inches. The plan of the interior shows two widely splayed openings in the west wall made to command the passage of the gateway, for this west wall would doubtless form part of the east side of the gateway itself, and there was also a window which looked out towards the Weekday Cross. The town wall would join the guard-room at some point, but where this was, seems a mystery which will never be solved. (1) The old name of the Postern Gate Inn. (2) Overton's plan of 1714 shows that at the end of the seventeenth or beginning of the eighteenth century, a sloping roof had been added on to the flat roof of the gate-tower, probably to make it of some practical utility. (3) An illustration of the Inn was given in the Transactions, Vol. XI., p. 103. The windows with their later additions will give an idea of the original height of the floor. (4) I am indebted to Mr. Allen, at the office of Messrs. Brewill and Baily, for the restored drawing made from the sketches and measurements placed in his hands.